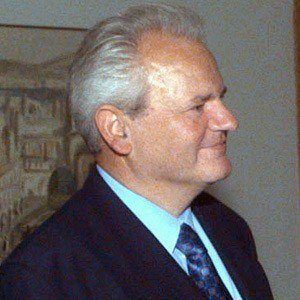 Affiliated with the League of Communists of Yugoslavia (SKJ) and, later, the Socialist Party of Serbia (SPS), this prominent Eastern European politician held office as President of Serbia beginning in the late 1980s and as President of the Federal Republic of Yugoslavia during the late 1990s. After earning a law degree from the University of Belgrade, he advised Belgrade's Mayor on economic issues. During his time in office, Yugoslavia dissolved and the Yugoslav Wars began. The United Nations' International Criminal Tribunal brought him to trial in 1999 on multiple crimes against humanity and war crimes charges. In 2006, he died in prison of a heart attack. His marriage to his childhood friend and fellow politician, Mirjana Markovic, resulted in two children: Marija and Marko. Prominent Serbian philosopher Mihailo Markovic supported Milošević's rise to power.